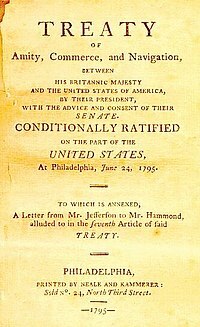 The Treaty of Amity, Commerce, and Navigation, Between His Britannic Majesty and the United States of America, commonly known as the Jay Treaty, and also as Jay's Treaty, was a 1795 treaty between the United States and Great Britain that averted war, resolved issues remaining since the Treaty of Paris of 1783 (which ended the American Revolutionary War), and facilitated ten years of peaceful trade between the United States and Britain in the midst of the French Revolutionary Wars, which began in 1792. The Treaty was designed by Alexander Hamilton and supported by President George Washington. It angered France and bitterly divided Americans. It inflamed the new growth of two opposing parties in every state, the pro-Treaty Federalists and the anti-Treaty Democratic Republicans. The Treaty was negotiated by John Jay and gained many of the primary American goals. This included the withdrawal of British Army units from forts in the Northwest Territory that it had refused to relinquish under the Paris Peace Treaty. The British were retaliating for the United States reneging on Articles 4 and 6 of the 1783 treaty; American state courts impeded the collection of debts owed British creditors and upheld the continued confiscation of Loyalist estates in spite of an explicit understanding that the prosecutions would be immediately discontinued. The parties agreed that disputes over wartime debts and the American–Canadian boundary were to be sent to arbitration—one of the first major uses of arbitration in modern diplomatic history. This set a precedent used by other nations. The Americans were granted limited rights to trade with British colonies in the Caribbean in exchange for some limits on the American export of cotton. The Jay treaty was signed on November 19, 1794,[by whom?] and submitted to the United States Senate for its advice and consent the following June. It was ratified by the Senate on June 24, 1795, by a two-thirds majority vote of 20–10 (the exact number necessary for concurrence). It was also ratified by the British government, and took effect February 29, 1796, the day when ratifications were officially exchanged. The treaty was hotly contested by Jeffersonians in each state. An effort was made to block it in the House, which ultimately failed. The Jeffersonians feared that closer economic or political ties with Great Britain would strengthen Hamilton's Federalist Party, promote aristocracy, and undercut republicanism. This debate crystallized the emerging partisan divisions and shaped the new "First Party System", with the Federalists favoring the British and the Jeffersonian republicans favoring France. The treaty was for ten years' duration. Efforts failed to agree on a replacement treaty in 1806 when Jefferson rejected the Monroe–Pinkney Treaty, as tensions escalated toward the War of 1812. The outbreak of war between France and Great Britain (and other countries) in 1793 ended the long peace that had enabled the new nation to flourish in terms of trade and finance. The United States now emerged as an important neutral country with a large shipping trade. From the British perspective, improving relations with the United States was a high priority lest it move into the French orbit. British negotiators ignored elements that wanted harsher terms in order to get a suitable treaty. From the American viewpoint, the most pressing foreign policy issues were normalizing the trade relations with Britain, the United States' leading trading partner, and resolving issues left over from the Treaty of Paris. As one observer explained, the British government was "well disposed to America. ... They have made their arrangements upon a plan that comprehends the neutrality of the United States, and are anxious that it should be preserved." Without warning American officials, the British government used the Royal Navy to capture nearly 250 neutral American merchant ships carrying goods from French colonies in the West Indies. Americans were outraged and Republicans in Jefferson's coalition demanded a declaration of war, but James Madison instead called for an embargo on trade with Britain. British officials told First Nations near the Canada–U.S. border that the border no longer existed and sold weapons to them. Congress voted for a trade embargo against Britain in March 1794. At the national level American politics was divided between the factions of Jefferson and Madison, which favored the French, and the Federalists led by Hamilton, who saw Britain as a natural ally and thus sought to normalize relations with Britain, especially in the area of trade. Washington sided with Hamilton. Hamilton devised a framework for negotiations, and President George Washington sent Chief Justice of the Supreme Court John Jay to London to negotiate a comprehensive treaty. American merchants wanted the British West Indies to be reopened to American trade. The treaty was "surprisingly generous" in allowing Americans to trade with Great Britain on a most-favored-nation basis. In return, the United States gave most favored nation trading status to Britain, and acquiesced in British anti-French maritime policies. American merchants obtained limited rights to trade in the British West Indies. Two joint boundary commissions were set up to establish the boundary line in the Northeast (it agreed on one) and in the Northwest (this commission never met and the boundary was settled after the War of 1812). Jay, a strong opponent of slavery, dropped the issue of compensation for slaves, which angered Southern slaveholders and was used as a target for attacks by Jeffersonians. Jay was unsuccessful in negotiating an end to the impressment of American sailors into the Royal Navy, which later became a key issue leading to the War of 1812. Article III states, "It is agreed, that it shall at all times be free to His Majesty's subjects, and to the citizens of the United States, and also to the Indians dwelling on either side of the said boundary line, freely to pass and repass, by land or inland navigation into the respective territories and countries of the two parties on the continent of America, (the country within the limits of the Hudson's Bay Company only excepted) ... and freely carry on trade and commerce with each other." Article III of the Jay Treaty declared the right of Indians, American citizens, and Canadian subjects to trade and travel between the United States and Canada, which was then a territory of Great Britain. Over the years since, the United States has codified this obligation in the provisions of Section 289 of the Immigration and Nationality Act of 1952 and as amended in 1965. As a result of the Jay Treaty, "Native Indians born in Canada are therefore entitled to enter the United States for the purpose of employment, study, retirement, investing, and/or immigration". Article III of the Jay Treaty is the basis of most Indian claims. The treaty was one of the major catalysts for the advent of the First Party System in the United States by further dividing the two major political factions within the country. The Federalist Party, led by Hamilton, supported the treaty. On the contrary, the Democratic-Republican Party, led by Jefferson and Madison, opposed it. Jefferson and his supporters had a counter-proposal to establish "a direct system of commercial hostility with Great Britain", even at the risk of war. The Jeffersonians raised public opinion to fever pitch by accusing the British of promoting Indian atrocities on the frontier. The fierce debates over the Treaty in 1794–95, according to one historian, "transformed the Republican movement into a Republican party". To fight the treaty, the Jeffersonians "established coordination in activity between leaders at the capital, and leaders, actives and popular followings in the states, counties and towns". Jay's failure to obtain compensation for "lost" slaves galvanized the South into opposition. The Federalists fought back and Congress rejected the Jefferson–Madison counter-proposals. Washington threw his great prestige behind the treaty, and Federalists rallied public opinion more effectively than did their opponents. Hamilton convinced President Washington that it was the best treaty that could be expected. Washington insisted that the U.S. must remain neutral in the European wars; he signed it, and his prestige carried the day in Congress. The Federalists made a strong, systematic appeal to public opinion, which rallied their own supporters and shifted the debate. Washington and Hamilton outmaneuvered Madison, who was opposition leader. Hamilton by then was out of the government, and he was the dominant figure who helped secure the treaty's approval by the needed 2/3 vote in the Senate. The Senate passed a resolution in June, advising the President to amend the treaty by suspending the 12th article, which concerned trade between the U.S. and the West Indies. In mid-August, the Senate ratified the treaty 20–10, with the condition that the treaty contain specific language regarding the June 24 resolution. President Washington signed it in late August. The Treaty was proclaimed in effect on February 29, 1796 and the House funded it[clarification needed] in April 1796, in a series of close votes and after another bitter fight. James Madison, then a member of the House of Representatives, argued that the treaty could not, under Constitutional law, take effect without approval of the House, since it regulated commerce and exercised legislative powers granted to Congress. The debate which followed was an early example of originalism, in which Madison, the "Father of the Constitution", lost. One interesting feature of this nationwide constitutional debate was an advisory opinion on the subject written by Chief Justice Oliver Ellsworth, in which he rejected any alleged right of the House of Representatives to decide upon the merits of the treaty. After defeat on the treaty in Congress, the Jeffersonian Republicans lost the 1796 presidential election on the issue. When Thomas Jefferson became president in 1801, he did not repudiate the treaty. He kept the Federalist minister, Rufus King, in London to negotiate a successful resolution to outstanding issues regarding cash payments and boundaries. The amity broke down when the treaty expired in 1805. Jefferson rejected a renewal of the Jay Treaty in the Monroe–Pinkney Treaty of 1806 as negotiated by his diplomats and agreed to by London. Relations turned increasingly hostile as a prelude to the War of 1812. In 1815, the Treaty of Ghent superseded the Jay treaty. Historians Stanley Elkins and Eric McKitrick note that, in conventional diplomatic terms and as a "piece of adversary bargaining", Jay "got much the worst of the 'bargain'. Such a view has to a great degree persisted ever since." They conclude that Jay did not succeed in asserting neutral rights, but he did obtain "his other sine qua nons"; he got none of things that were "desirable, but not indispensable". They add that Jay's record on the symbolic side was open to many objections. However, on the "hard" (or realistic) side, "it was a substantial success, which included the prevention of war with Great Britain". Perkins gave more weight than other historians to valuable concessions regarding trade in India and the concession on the West Indies trade. In addition, Perkins noted that the Royal Navy treated American commerce with "relative leniency" during the wars, and many impressed seamen were returned to America. As Spain assessed the informal British-American alliance, it softened its previous opposition to the United States' use of the Mississippi River and signed Pinckney's Treaty, which the Americans wanted. When Jefferson took office, he gained renewal of the commercial articles that had greatly benefited American shipping. a shrewd bargain for the United States. It bet, in effect, on England rather than France as the hegemonic European power of the future, which proved prophetic. It recognized the massive dependence of the American economy on trade with England. In a sense it was a precocious preview of the Monroe Doctrine (1823), for it linked American security and economic development to the British fleet, which provided a protective shield of incalculable value throughout the nineteenth century. Mostly, it postponed war with England until America was economically and politically more capable of fighting one. In the HBO miniseries John Adams, Vice President John Adams is shown casting the tiebreaker vote in favor of ratifying the Jay Treaty. In reality, his vote was never required as the Senate passed the resolution by 20–10. Furthermore, the Vice President would never be required to cast a vote in a treaty ratification, because the Vice President votes only in case of a tie, and Article II of the Constitution requires that treaties receive a two-thirds vote for approval. ^ Jerald A. Combs (1970). The Jay Treaty: Political Battleground of the Founding Fathers. U of California Press. p. 120. ISBN 9780520015739. ^ Combs (1970). The Jay Treaty: Political Battleground of the Founding Fathers. p. 121. ISBN 9780520015739. ^ Patrick Richard Carstens (2011). Searching For the Forgotten War – 1812: United States of America. Xlibris. p. 178. ISBN 9781456867553. ^ Francis D. Cogliano (2014). Emperor of Liberty: Thomas Jefferson's Foreign Policy. Yale UP. p. 121. ISBN 9780300179934. ^ Emma S. Norman (2014). Governing Transboundary Waters: Canada, the United States, and Indigenous Communities. Routledge. p. 36. ISBN 9781135040208. ^ Spencer C. Tucker (2014). The Encyclopedia of the Wars of the Early American Republic, 1783–1812: A Political, Social, and Military History. ABC-CLIO. p. 739. ISBN 9781598841572. ^ Paul Finkelman (2014). Slavery and the Founders: Race and Liberty in the Age of Jefferson. pp. 171–72. ISBN 9781317520252. ^ "First Nations and Native Americans". United States Embassy, Consular Services Canada. Archived from the original on April 22, 2009. Retrieved March 3, 2009. ^ Estes, 2000, pp. 398–99. ^ "Jay’s Treaty", American Foreign Relations. ^ Casto, William. "Two Advisory Opinions by Chief Justice Oliver Ellsworth", The Green Bag, Vol. 6, p. 413 (2003). ^ Elkins and McKitrick (1995). The Age of Federalism. p. 412. ISBN 9780199796052. —— (2006). The Jay Treaty Debate, Public Opinion, and the Evolution of Early American Political Culture. ISBN 978-1-5584-9515-9. "Primary Documents in American History – Jay's Treaty". Library of Congress. "British-American Diplomacy – The Jay Treaty 1794 and Associated Documents". Yale Law School. Nickels, Bryan (2001). "Native American Free Passage Rights Under the 1794 Jay Treaty: Survival Under United States Statutory Law and Canadian Common Law". Boston College International and Comparative Law Journal. Boston College Law School. 24 (2): 313–40. Retrieved September 12, 2012.